Home » Blog » News » Contest #11!!! Contest #10 is over. I’ve chosen the a winner a signed copy of “Tentacles” is in the mail. This brings me to contest #11. 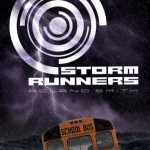 The winner will get a signed copy of my new novel STORM RUNNERS. Press the Contest! button on my web page and follow the instructions. Good luck! Number two will be out this Fall. The Surge. ← March 7, 2011. I’m back.